A Vice News journalist arrested in Turkey says he feels a "massive sense of responsibility" for his Iraqi translator, who remains in custody. Britons Jake Hanrahan, 25, and Philip Pendlebury were arrested on 27 August with Mohammed Ismael Rasool. They were accused of working for a "terrorist organisation" but deny any wrongdoing. The Britons were freed on 3 September. But Mr Hanrahan told BBC Radio 4's Today programme they would not be able to celebrate until Mr Rasool was freed. In his first interview since being released, Mr Hanrahan said: "Yes, it was a traumatic experience, but I think the biggest burden right now is the fact that my friend and colleague Mohammed Ismael Rasool is still in prison." Conflict between security forces and the pro-Kurdistan Workers' party (PKK) has flared up in the south-east of the country in recent weeks, and Turkey has limited journalists' access to the region. The Vice News group were arrested as they drove to their hotel after filming violent clashes between the police and Kurdish youths in Diyarbakir. Mr Hanrahan, from Northampton, said: "About 20 police officers just jumped off the steps, just swarmed the car, took us in, and searched our rooms and eventually just told us you've been arrested for terror offences. "And then that night we were taken and put in solitary cells". "We were treated as well as can be expected in a foreign prison - it could have been much worse. A lot of the guards inside the prison were quite sympathetic towards us and kind of understood that we were innocent," Mr Hanrahan said. "The conditions were what you would expect and they allowed us meals, you know we had food." During their captivity the men were questioned over alleged links to both the so-called Islamic State group and PKK militants, and later formally charged by a Turkish court with "working on behalf of a terrorist organisation". The Foreign Office said it was concerned by the arrests and expected Turkey to uphold its obligation to uphold press freedom under EU and UN human rights law. And human rights group Amnesty International also criticised the Turkish authorities for detaining the men. On 3 September Mr Hanrahan and Mr Pendlebury were released but Mr Rasool, 24, was kept in custody pending further investigations. "That is the worst possible thing right now for us. 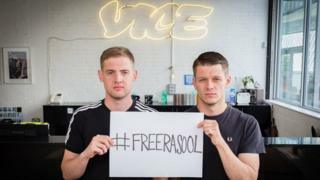 We feel massive responsibility and Vice News are doing everything they can," Mr Hanrahan said. "It's not a question of, 'Oh the two western journalists are free and lets leave a guy behind.'" He said it was important that journalists continued to cover the region: "You can't stay away from something because there's a possibility something bad might happen otherwise journalists might not do anything. "I think it's important to cover these things - you know a lot of civilians have been killed - there's a bigger issue here and we didn't just want to do it from the desk because that's not what we do at Vice News, we want to go and find out exactly what's happening." Vice News is an international news organisation which publishes documentaries and written news, focusing on "under-reported stories from around the globe".